Recommended for Greenhouse application, nurseries, hydroponics, entomologists, and researchers in plant and vegetation ecology. Our Infrared Thermometer, has been especially designed for cultivation and propagation of seed to plant marketability. This Infrared Thermometer Instrument is for "Greenhouse" application, it measures plant- leaf canopy temperature to optimize yield and detect disease. You position the Instrument suspended from its cable "looking downward" from the " sun light " on the leaf can be read with this Infrared Thermometer. 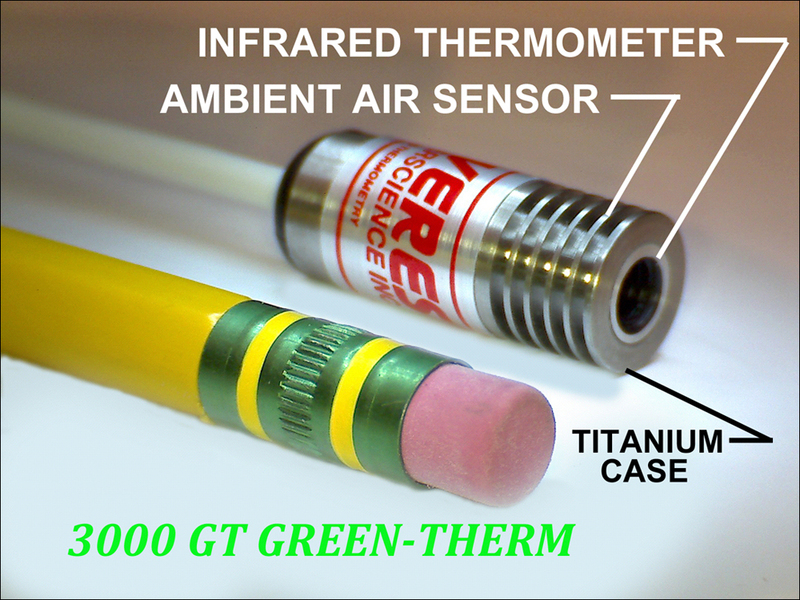 The Model 3000GT - GREEN THERM has been designed specifically for Horticulture and Crop Science Researchers, Greenhouses and Grow Chambers, Plant & Vegetation Ecology. This Instrument is an infrared Thermometer for "Greenhouse" application that measures "ambient" temperature in an indoor application. It measures plant-leaf-canopy temperature to optimize yield, marketability and detect disease. You position the Instrument suspended from its cable "looking downward" at the plant-leaf-canopy for its temperature.